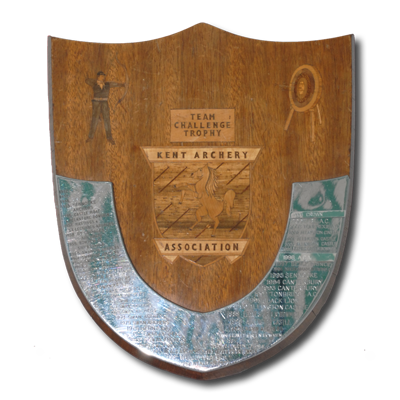 Wooden shield with marquetry inlays of an archer, a target and the KAA shield and a metal overlay for winners' names. Kent club senior recurve freestyle team with the highest combined score. Open only to associated clubs of the Kent Archery Association and archers for whom the club for which they have entered is their primary club. senior gentlemen shooting the York round with the recurve freestyle bow. A team consists of three archers from the same club, including at least one lady. Teams do not require nomination or entry for the award in advance - a team will be determined on results and will consist of the three highest scoring qualifying archers.